The “Infinite” storyline has come to a close, and it leaves us with a freed world, a secret revealed, a family reunited, and a whole lot of questions. After Jerrica’s in-concert reveal, she’s joined at the mic by Pizzazz, where the two of them convince the audience to be themselves, stop letting Jemcorp manipulate them and eschew the tech which controls their lives. The audience’s reaction is… a little weird to me, I have to admit. They’re a lot more negative towards being manipulated by tech rather than their Misfits and Holograms having been flat-out murdered. This really doesn’t cause more of a stir? I’m just going to assume there was a lot of mind-control being pumped into people’s brains, judging from their reactions when Pizzazz convinces them to remove their Jemstar earrings. Back at Jemcorp, Eric’s assistant Elise Harcourt is frantically trying to run damage control. Eric is nowhere to be found, but Synergy is there and reveals something to Elise that we never actually see. The Holograms, Misfits, and the concert-goers move onto the wall, where they demand it be opened and, sure enough, they are finally reunited with their loved ones. Elise shows up to reveal that she was helping take down Jemcorp from the inside, and tells everyone that both the board and Eric have fled, although I noted that Elise only has Synergy’s word for this. Alt-Emmett thanks our Holograms for reuniting him with his daughters (he specifically includes Stormer in that plurality, which is a lovely thing to see), and he says that he will be helping Elise and Techrat rebuild the world. Our girls return home, where they have “the talk” with Pizzazz about keeping Jerrica’s secret identity to herself, and she agrees – if somewhat petulantly. Truthfully, the resolution of the Infinite storyline feels rushed and just a bit too pat, although the “THE END?” stinger suggests we aren’t quite done just yet. We have no idea what happened to Jemworld’s Eric and Pizzazz, we don’t know what activating Silica did to their Synergy, and the reunification of Jemworld seems far too casual in response to the enormity of Jemcorp’s lies, manipulations and murders. The art, on the other hand, remains fluid and expressive, with one caveat. There’s a major coloring continuity error where Jerrica is still being portrayed as Jem instead of a glam version of herself — her hair should be blonde to stress that this is Jerrica Benton, not the manufactured pop star that is Jem. It lessens the impact of Jerrica overcoming her insecurities and anxieties to show people who she is, and it takes away from the “be yourself” message she’s trying to spread. Hopefully this will be corrected in a trade collection. This storyline has been amazing, but the ending leaves me a little unsatisfied, hence the docking of points. 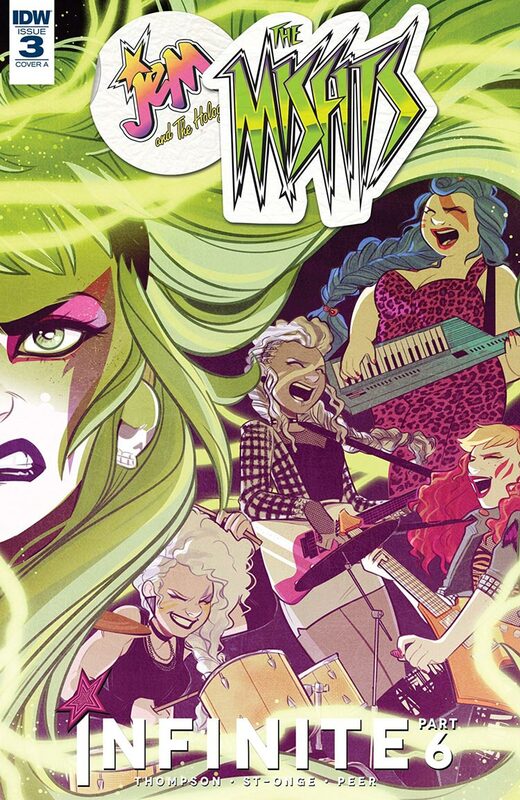 If IDW continues to have Thompson and crew move forward with Jem stories, I’ll be far less disappointed, but if the tale ends here then there are too many unanswered questions. I suppose leaving one’s audience wanting more can be considered a good thing in the long run, but I’d feel a lot more comfortable if that “more” was guaranteed.